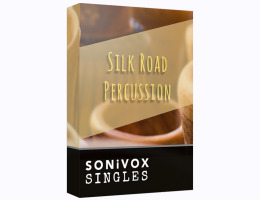 This Silk Road download collection gives you plenty to work with an expansive palette of single hits, flams, and sampled phrases to get your tracks moving in hypnotic fashion. Collection includes 20 Megabytes comprising High and Low Tombek and Small, Medium, and Large Nagada. Featuring drums popular throughout the Middle East and various countries on the African continent, the Silk Road Frame Drum collection will stamp your percussion tracks with an authentic ethnic imprint. 14" and 22" frame drums provide a multitude of articulations and a wide array of single hits, flams, and sampled phrases from which to build a propulsive rhythm bed. Egyptian Riqqs and a Persian Daff will add an appropriate jangle while the Sufi Bandir can be utilized in a variety of percussive applications to splendid effect. Collection includes 14" and 22" Frame Drums, 2 Egyptian Riqqs, Persian Daff, and Bandir Drum.